Great show with lots of interesting stuff in a walk about giant time capsule. The promoters, U.S. Antiques Shows, have hosted an excellent revival of mostly the 1960's era artifacts. Great escape from the stressed and crumbling world outside. The Good: One stand was completely filled with lighters of all shapes like military tanks, cameras, baseballs, girls in pools, really cool items that crossed over with collectors from die hard Zippo fanatics to kids to the impulse buyer catagory's like baseball collectors and others like an elephant collector. Or owls. "Look, there's a lot of zany collectors out there." said the proprietor Ira Pilossof. "I love them all." A lot of "millenials" like ashtrays and lighters, not because they smoke, they don't much anymore, they just inhale those hookah-pipe mist tubes called e-cigs. But they like the total retro "Mad Men" look. A well placed lighter or ashtray will retro-cool a flat faster than Dwell magazine or a James Bond martini shaker. Ira also sells at the Garage flea market on 26th street every week. But this is his big uptown outing. Booth was packed. In fact the entire show was elbow to elbow. The Bad: Yep, stuffed bull frogs playing musical instruments. They actually are kind of interesting in a morbid way but even Mexico said enough and banned this evil taxidermy in the 1950's. Here was a whole jazz band of the guys nailed down to a board. "I feel for them." said the nice lady running the booth. "I didn't do it." 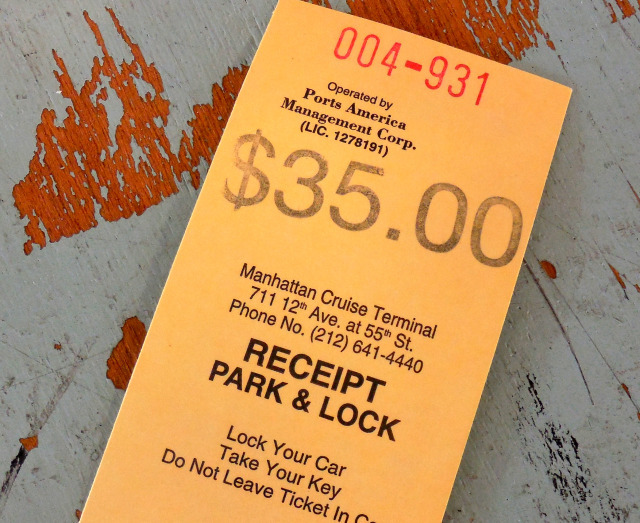 The Ugly: The Port of NY charging thirty five dollars to park at a pier on a Saturday.